aFrom the Department of Radiology, George Washington University Hospital, Washington, DC. SUMMARY: Papilledema, defined as swelling of the optic disc, frequently occurs in the setting of increased ICP and in a variety of medical conditions, including pseudotumor cerebri, sinus thrombosis, intracerebral hemorrhage, frontal lobe neoplasms, and Chiari malformation. Noninvasive imaging of the ON is possible by using MR imaging, with a variety of findings occurring in the setting of papilledema, including flattening of the posterior sclera, protrusion of the optic disc, widening of the ONS, and tortuosity of the ON. Early recognition of papilledema and elevated ICP is of paramount importance for ensuring restoration of vision. Newer advanced MR imaging techniques such as fMRI and DTI may prove useful in the future to assess the potential effects of papilledema on retinal and visual pathway integrity. In attempting to detect and diagnose papilledema as early as possible in patients, MR imaging is becoming a useful noninvasive method. Because MR imaging can provide gross visualization of the optic globe, ON, orbits, and optic tract,9 it is an ideal tool to study the details of papilledema. This review provides a brief outline of the common MR imaging findings of papilledema and its pathologic mechanisms. The SAS of the ON is a multichambered tubular system with a blind end behind the globe. The SAS of the ON is anatomically classified into a bulbar segment, intraorbital segment, and canalicular portion. These divisions are not uniform in architecture: The bulbar segment consists of trabeculae, the intraorbital segment consists of septa and pillars, and the canalicular portion consists of trabeculae and pillars.10 This architectural meshwork may play an important role in maintaining the pressure within the nerve. ONS enlargement. 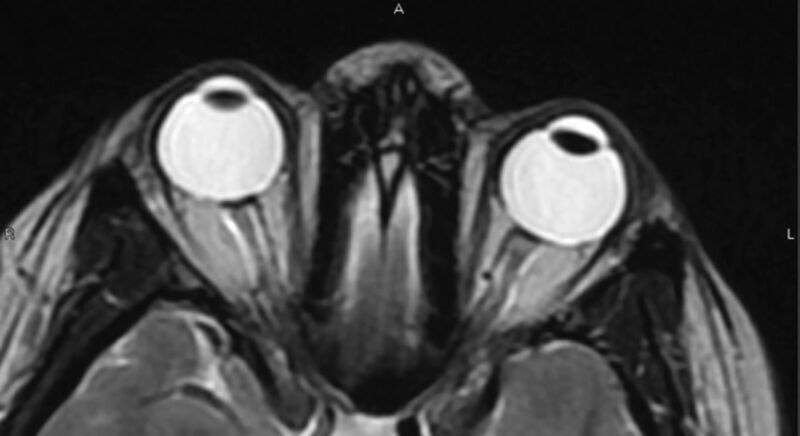 A, Coronal T2-weighted FSE image demonstrates bilateral widening of the ONS in a 32-year-old woman who presented with acute vision loss and headaches and was found to have papilledema on fundoscopic examination. The ONSs are abnormally increased in size (TR, 6816.7 ms/TE, 84 ms; 3-mm thickness; FOV, 18 cm; matrix, 256 × 224; 4 excitations). B, Axial T2-weighted FSE image demonstrates the widening of the ONS bilaterally in a 31-year-old woman with known papilledema presenting with headaches (TR, 4400 ms/TE, 80 ms; 5-mm thickness; 6-mm spacing; FOV, 24 cm; 320 × 256 matrix). Several studies have demonstrated posterior scleral flattening (Fig 2) in patients with elevated ICP.13⇓–15 Gibby et al13 noted this finding on CT scans and considered it to be the mildest in the spectrum of changes leading to the protrusion of the ON head into the globe. Atta and Byrne14 noted flattening of the posterior sclera on sonography in some patients with choroidal folds and papilledema. 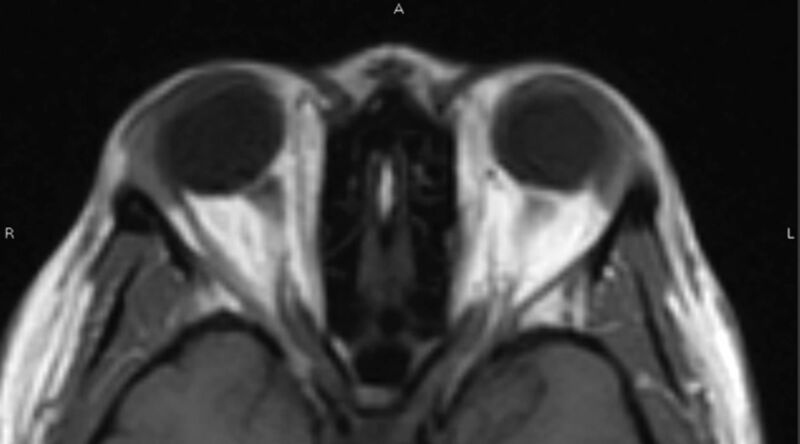 Jacobson15 found bilateral flattening of the posterior sclera and distension of the perioptic SAS on MR imaging in a patient with elevated ICP and unilateral papilledema. These findings suggest that the combination of acquired hyperopia and choroidal folds may indicate pseudotumor cerebri in rare patients whose distal ONs are structurally resistant to developing papilledema. Optic papilla protrusion. In this T2-weighted axial image, both ON papillae protrude into the vitreous space of the globe. 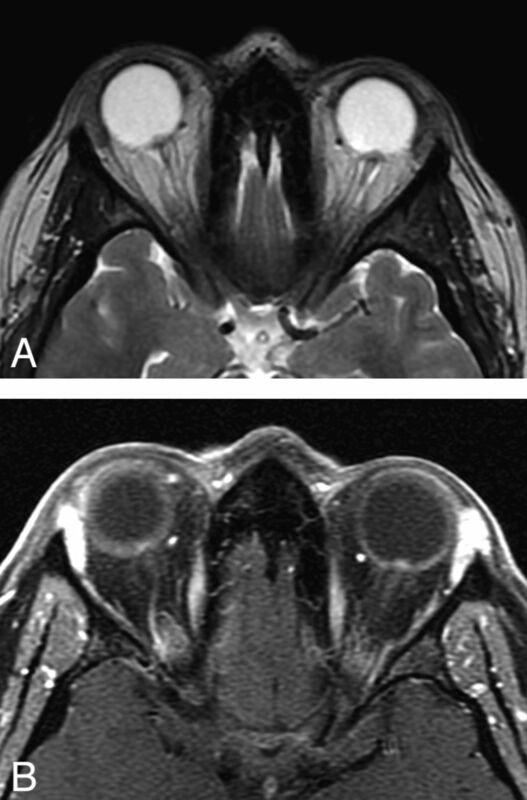 This 32-year-old woman had experienced headaches and vision loss on presentation; she was also found to have papilledema on fundoscopic examination (same patient as in Fig 1A). A, Axial T2-weighted image demonstrates bilateral ON head protrusion (TR, 3000 ms/TE, 84 ms; 5-mm thickness; FOV, 24 cm; matrix, 320 × 256; 1 excitation). B, Corresponding axial T1-weighted postcontrast image demonstrates enhancement of the ON heads (TR, 766.7 ms/TE, 9 ms; 3-mm thickness; FOV, 18 cm; matrix, 320 × 191; 1 excitation). The optic papilla is considered by some to be the site most vulnerable to the effects of elevated CSF pressure in the nerve sheath.17 Normally, the optic papilla appears as a flat hyperintense (hypointense relative to the vitreous of the globe of the eye) region in the posterior sclera. In pseudotumor cerebri, intraocular protrusion of the optic papilla is occasionally observed on MR imaging. Brodsky and Vaphiades6 found prelaminar enhancement in 50% of MR images of patients with pseudotumor cerebri. However, they also found an absence of prelaminar enhancement in some patients with florid papilledema. 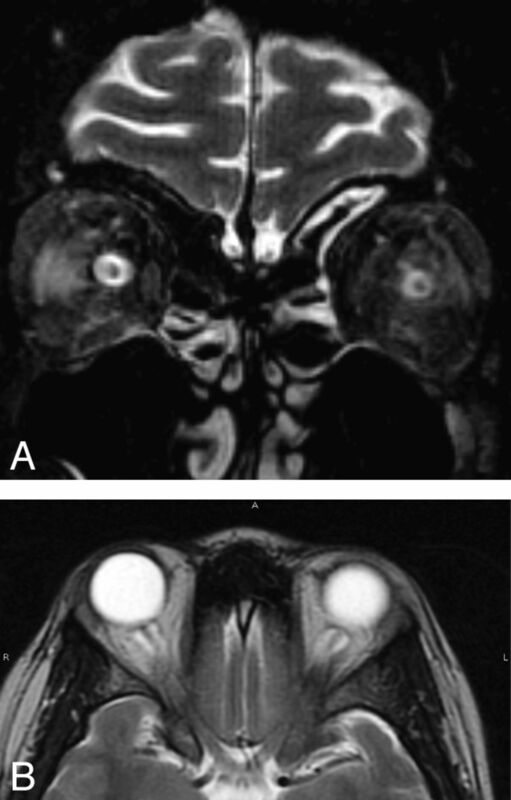 Intraocular protrusion was also demonstrated by Jinkins et al11 in 10 (67%) of 15 patients with pseudotumor cerebri on MR imaging. Posterior globe flattening. Flattening of the posterior globe is thought to occur in the same setting as papilledema with increased ICP. In this image, the site of the optic papilla is flattened and the normal globe contour is lost. This 37-year-old woman presented with headache and a sensation of head pressure. She was found to have papilledema and increased CSF opening pressure on lumbar puncture. (TR, 5650 ms/TE, 88 ms; 5-mm thickness; FOV, 24 cm; 320 × 256 matrix). ON tortuosity. Bending of the ON can be seen more prominently in the right ON in this 40-year-old woman with history of headache diagnosed with increased ICP. In this particular case, there is a smear sign, in which orbital fat obscures part of the tortuous ON (TR, 620 ms/TE, 9 ms/TI, 0 ms; 5-mm thickness; 6-mm spacing; FOV, 24 cm; 256 × 192 matrix). While researchers have investigated the relationship between elevated ICP and papilledema, they have also used ocular and ON abnormalities to diagnose elevated ICP.27 The ophthalmoscopic appearance of IIH is most often characterized by bilateral ON head swelling, but this can be subtle and variable.28⇓⇓⇓⇓–33 Furthermore, papilledema may be asymmetric or unilateral,33,34 and the degree of ON head swelling is poorly correlated with ICP. Once the diagnosis of elevated ICP is established, the appearance of the discs and the severity of papilledema are commonly used as measures of disease severity and response to therapy. However, the degree of papilledema does not predict the severity of symptoms. Increased CSF pressure might produce different disc abnormalities depending on the normal size of the ONS.8 Further studies should lead to a better understanding of the mechanisms and augment our ability to detect papilledema on imaging and allow early intervention to maintain or restore vision. MR imaging findings in papilledema only represent 1 aspect of papilledema—the anatomic alterations of the optic disc and nerve. Recent advances in MR imaging make it possible to more closely examine the interface between anatomic disruption and physiologic dysfunction.36 Theoretically, MR imaging could be used to predict the visual outcome of papilledema as a prognostic test—deficits in functional imaging of the retina or disruption of the optic pathways could suggest a greater risk of vision loss. Visualization of the fiber tracts from the retina to the visual cortex is also being investigated with DTI.58,59 DTI can map optic radiations within the brain with a great deal of accuracy compared with postmortem dissections.60 Retinal ischemia in an animal study showed decreased anisotropy within the optic radiations, suggesting that DTI can detect changes in the visual pathways as early as 3 days from injury, well before the potential appearance of papilledema.61 Other experiments in rats have demonstrated decreased anisotropy within the ON following glaucoma induction and ON injury.54,62 DTI has demonstrated decreased anisotropy and increased diffusivity in children with ON hypoplasia in septo-optic dysplasia.63 Disruption of these pathways leading to atrophy of distal axons projecting from the retina64 could predict visual loss from degeneration related to papilledema. Papilledema represents a serious warning sign for elevated ICP and potential vision loss in a variety of clinical settings. MR imaging may facilitate its detection and demonstrate changes of elevated ICP well before the appearance of papilledema on fundoscopic examination. MR imaging signs such as flattening of the posterior sclera, dilation of the ONS, and protrusion of the optic disc head can be useful in the setting of papilledema. Although the mechanisms causing papilledema and its associated signs are not entirely clear, the role for noninvasive imaging in this clinical condition is evident. Future advances in DTI, fMRI of the retina, and high-resolution MR imaging hold the promise of demonstrating the effects of papilledema on the visual pathway in patients.